If you've been reading my blog for a long time, you know I have a thing for UPS. I love it. I love the brown trucks, I love the brown uniforms, I LOVE IT WHEN THOSE GUYS BRING ME PRESENTS. I love UPS so much that I once crouched behind some bushes to take video of them leaving our neighborhood distribution center at the holidays so I could watch it whenever I wanted to. And it just so happens that twice in the last couple of weeks, I've seen UPS-related things that made me smile. 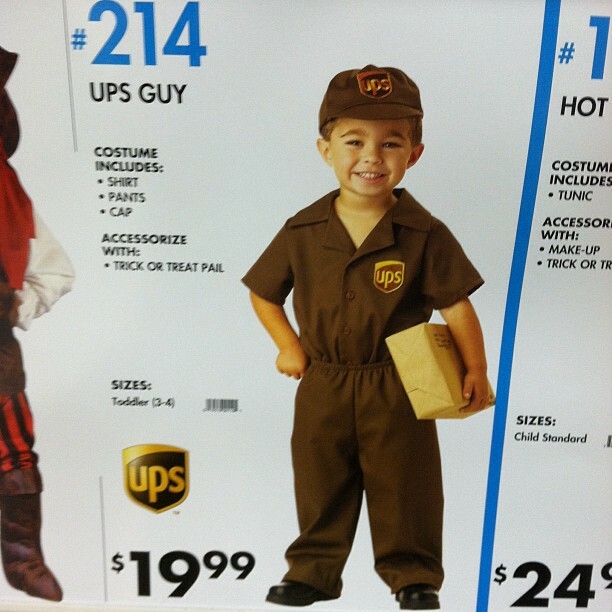 Do you KNOW how much I would die if Jake dressed up as a UPS man for Halloween? THERE ARE NO WORDS. It would be the best Halloween of all time. Of. All. Time. Bottom line: I AM NOT THE ONLY ONE. 'Fess up, y'all. The UPS guy who delivers to my office is a psycho malcontent. We're always trying to engage him (it's become a game), and he just won't do it. He REFUSES to talk at ALL, except one time Melissa got him to respond. The five people in our office were all standing in the front reception area chatting, and he came in. Melissa said (super cheerily), "HEY! How are YOU today?!" He looked at the five of us, and snarled, "normal." And walked out. My hairdresser's hubby is a UPS guy. He's nice, but he isn't one who would make the UPS calendar! This is awesome! Last year I had a newborn and 3 year and did all my Christmas shopping online. I joked on my blog that I wans't having an affiar with our UPS man. We moved into a new house this past June and I was here doing some things the day before we moved in when the UPS man pulled up. I had ordered some things for my bedroom, he walked up and low and behold it was an ex-boyfriend. HA! I'm married to a UPS guy too, so I loved this post, lol. My hubby is a fantastic driver and all of his customers love him. He's very friendly and always bringing home treats and freebies that businesses are giving him. Love him :) And love UPS for employing my sweet hubby. I love to get those deliveries to my door as well, although, they usually contain some sort of computer parts for John, but, hey, its another adult to talk to, right! When I was a junior at MC, the woman living in the apartment beneath me was DEFINITELY having an affair with the UPS guy, though! He would come every Wednesday and Friday morning as I was getting in bed (I was working Tuesday and Thursday night shifts) and leave about the time I got up to get ready for afternoon classes! Don't know if either of them were married, but he was not the guy who lived in the apartment with her! Can't imagine he kept that job very long, don't think he got a whole lot of deliveries made, except to my neighbor! This is NOT a creepy request to stalk you! But if you want to send me your address I can send you all the UPS goodies my boyfriend and I accumulated! (His mom's boyfriend is a driver for them) They're all new (never worn) and include sweatshirts and a few funny hats! :-) let me know if you're interested! I LOVE BROWN!!! You plan that Six Flags trip and I'll order our BFF necklaces.